Coffee, Clutter and Chaos | Page 92 of 105 | Managing it all, one latte at a time!! For those of you who don’t know me, I am a bit pudgy. It has been a problem for me for most of my life, and I have fought with my weight even more since I had my two children. I had so many friends having success on Weight Watchers that I decided to try it also. I was doing well, and had lost a few pounds, and then October happened. October was rough. Well, I am back on Weight watchers, as of December 01. Bluebell is doing Weight Watchers also, and that will be so helpful to me. However, another thing I love to do besides Blogging, and playing World of Warcraft (yes I AM that girl), is baking. 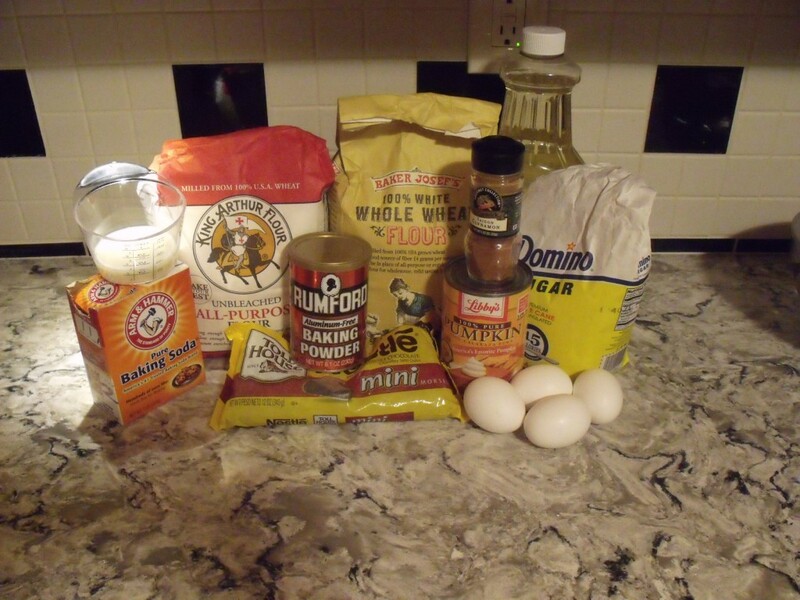 Baking is not always what you should be doing when you are counting your points, so I am always on the lookout for amazing low sugar, low fat foods. I recently posted my recipe for Diabetic Chocolate Swirl Cheesecake, which was a big hit. 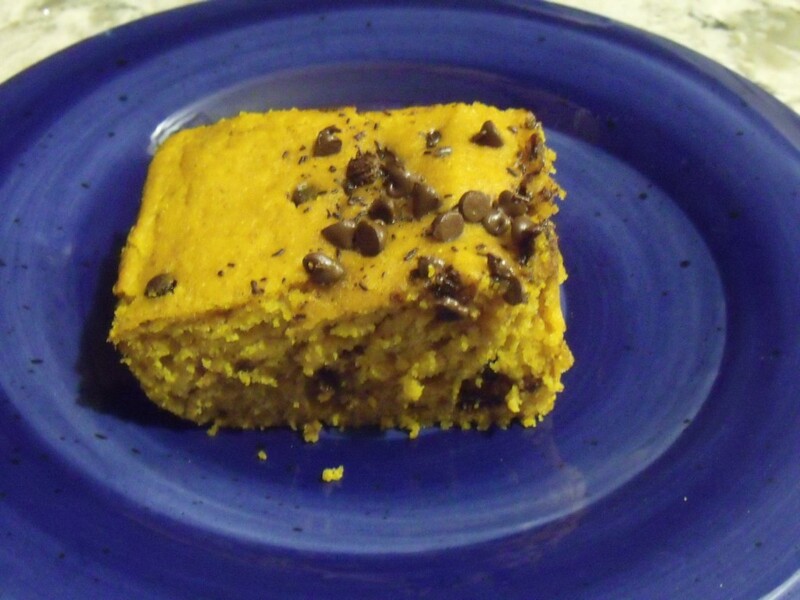 So last night I was looking for something to bake and found a low sugar pumpkin bar recipe. 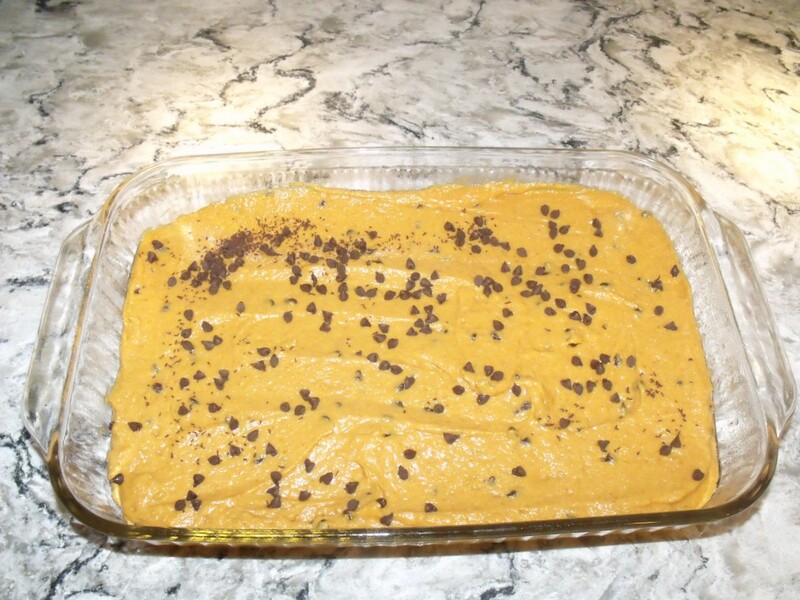 I found this recipe on a Group Recipe website. It was easy to make, and the bars were really delicious. They ended up being 4 WW points which is about 200 calories each. If I substitute unsweetened applesauce for the oil, it will take them down to 3 points! I will do that next time. Preheat oven to 350 F. Lightly coat 13 x 9 x 1 baking pan with cooking spray. 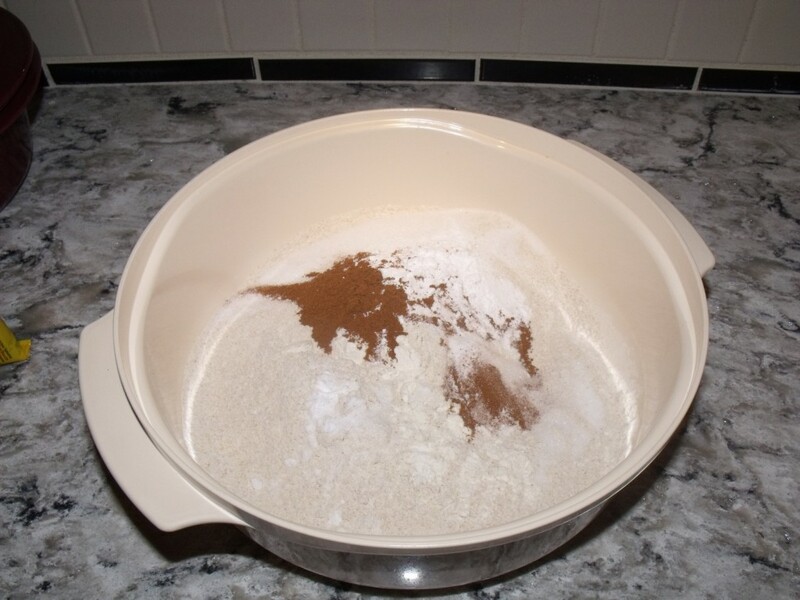 In large bowl combine both flours, sugar, baking powder, cinnamon, baking soda and salt. 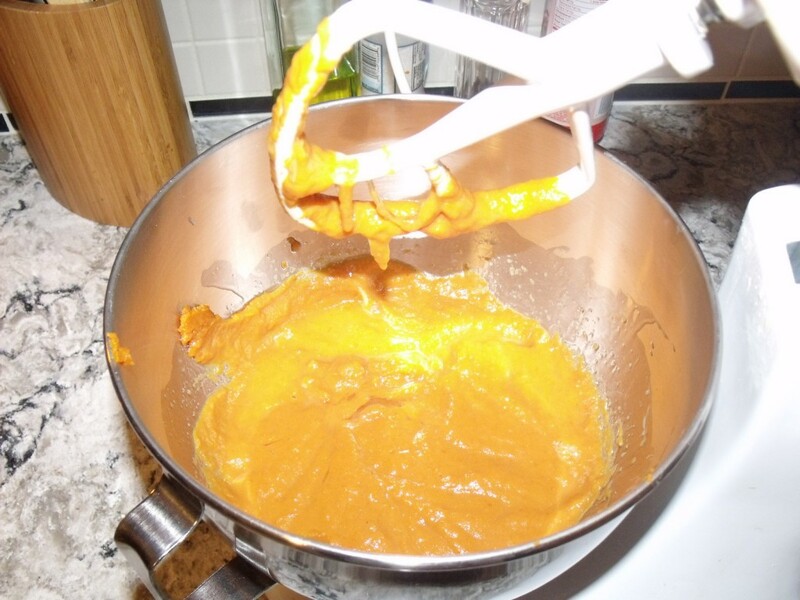 In a medium bowl combine the pumpkin, eggs, oil and milk. 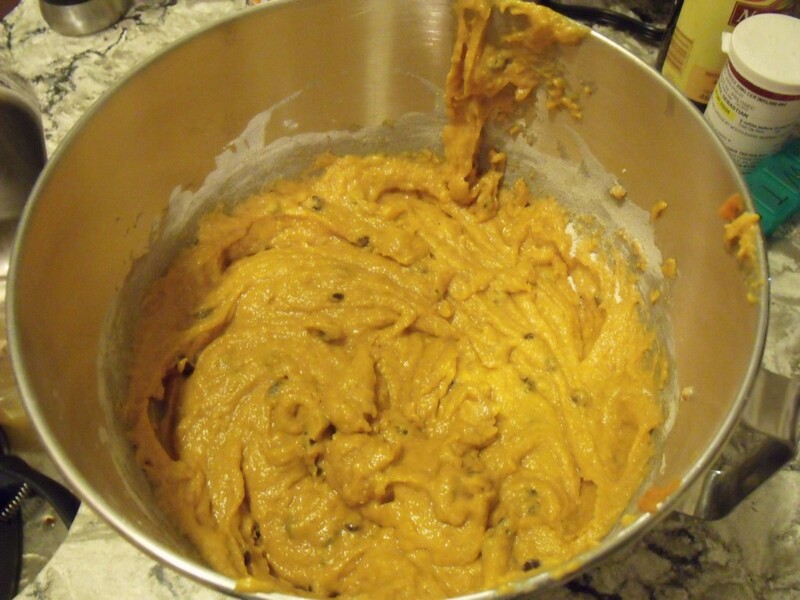 Add the flour mixture and 1/3 cup of the chocolate chips to the pumpkin mixture and mix until just combined. Spread it evenly in the prepared pan. Sprinkle the remaining chocolate chips over the top. Bake at 350 for 23 minutes or until a toothpick inserted in the center comes out clean. Cool on a wire rack. Cut into 18 bars. Bake, put on a plate and enjoy!! Today is November 30th. The day that NaBloPoMo comes to a close. This is my third year participating in NaBloPoMo or National Blog Posting Month. I also did the most posting this year. I will admit that I have never posted EVERY day in any of the three years I have participated. However, this year I did the best, only missing three days. So I am ready to move on to December. 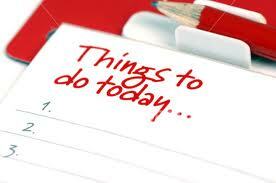 Lots to do. High school swim meets, Hanukkah lights to light, Christmas trees to trim, egg nog to drink, cookies to bake, and presents to wrap! One of my favorite times of the year! It is a bittersweet month for me as it is also the 2nd anniversary of my fathers death. He had a stroke on Christmas day 2010, and died in the early hours of the morning on December 26th. What happens when you can’t say no. Sometimes I can’t see the forest for the trees. I get so wrapped up in what is going on in my own life I don’ always see what is going on with others. After all, I work two part time jobs, I go to school full time, I blog, and I have 4 kids, three of whom still live at home. And of those three kids, two are in Boy Scouts, one is on the high school swim team, one is trying to get his learner’s permit and one has a part time job he needs rides to and from. Oh, and don’t forget the weekly allergy shots, random medical appointments, and trying to have a social life….. All of these activities require a certain amount of time and attention…..and brain energy. And that is what seems to spread around the least….the brain energy. I hate to tell anyone “no”. I have some amazing friends. I love them all. I would do anything for them. Recently Bluebell and I were at a party and I realize that some of our friends are taking their family to Disney World for a week. They have a dog and a cat. I ask what they are doing with the animals while they are gone. They tell me they are boarding the dog, but they are leaving the cat at home. At that moment it is as if I have a mental seizure. For a brief instant I have a huge case of amnesia and forget the 5 million things I have going on in my life. Picture a person mentally displaced from their body. Floating above their body watching it do things they have no control over. That is how I feel as I hear myself say, “Oh, we will be happy to check in on the cat while you are gone.” Bluebell gives me a look like, “Woman, have you lost your mind?” and all I can do is smile like the village idiot and make a feeble gesture. 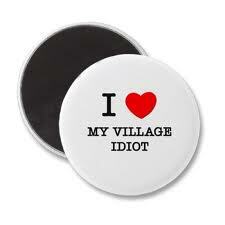 Now don’t get me wrong, I LOVE my friends, and I am happy to help them out. That is not the problem. You see the problem is that I am so busy that Bluebell ends up keeping the promise I have made, and God love her, she loves me enough to do that. That is my problem. I always want to help people. I work for a dermatologist doing skin care procedures. I LOVE my clients!! I would do almost anything for them. I have worked on a Sunday afternoon, I have worked at 8:15 in the morning, I have worked at 5:30 in the evening! I have done free procedures, I have given away products I have purchased for myself. (Thank goodness my boss doesn’t read my blog…..) I do this because I TRULY TRULY believe in paying it forward. I know that good will come to me if I do good for others. However, I don’t do good for others to get back for myself. I do it for a completely different selfish reason. I do for others because it makes me feel good. Simple as that. I could be having a super crappy day. Maybe I had a horrible ride in to work. Maybe Bluebell and I were fighting. Maybe yet again I had to yell at my kid about his grades. Anything and everything could have gone wrong, yet when I walk into a room with my client, I am happy to be there with them and it is all about them. I know that what I do makes them feel better about how they look, which intrinsically helps them feel better about themselves, which in turn fuels how they see themselves and how they relate to the world. WOW!! 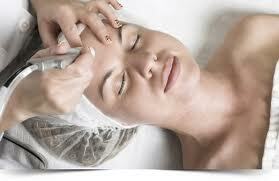 That is heavy stuff for a 30 minute chemical peel or microdermabrasion appointment, but that is how I see it. So I guess even though I am my own worst enemy and constantly get myself or Bluebell into trouble by always overbooking us and working when I could be with my family, in the big picture being my own worst enemy is a pretty darn good thing!